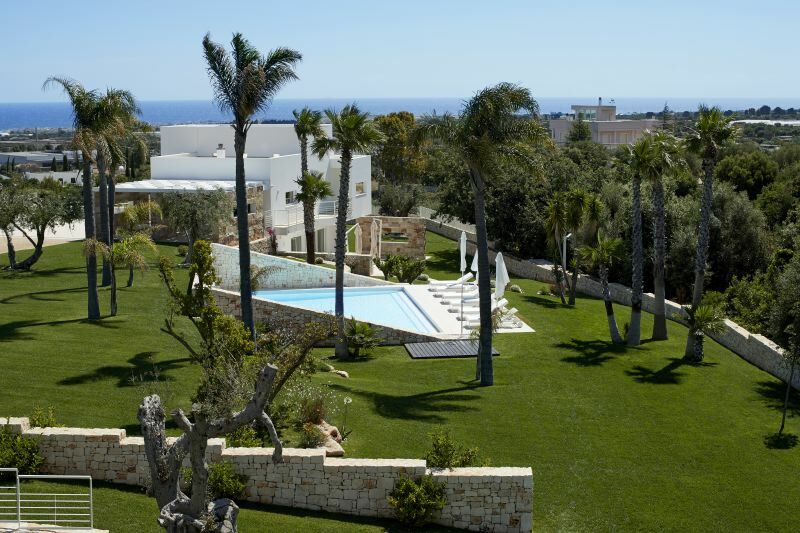 The two villas are located 5 Km away from Polignano a Mare, one of the best-known seaside localities in Puglia. This medieval village perched above the high, jagged coast has maintained its changeless charm with the succession of little alleys, typical white houses and loggias overhanging the sea. The stretches of coast and beaches are very beautiful and distinctive, Cala Paura, Cala Porto, Ponte dei Lapilli, Porto Contessa and Porto Cavallo are the best known little creeks. The stunning Cala Lama Monachile is a deep cove situated to the north of the old historic center. The streets in the center of the village contain all types of stores where visitors can go shopping and make purchases even quite late at night in the summer months. There are also many venues where it is possible to have supper and listen to live music. Both villas are distributed over two levels, furnished with an excellent modern design thanks to the attention paid to detail, they offer all the necessary mod cons for enjoying an unforgettable holiday. They are situated on both sides of the swimming pool and have private outdoor spaces. The two villas can be booked together for a total of 12 beds, in this case guests will have exclusive use of the swimming pool. 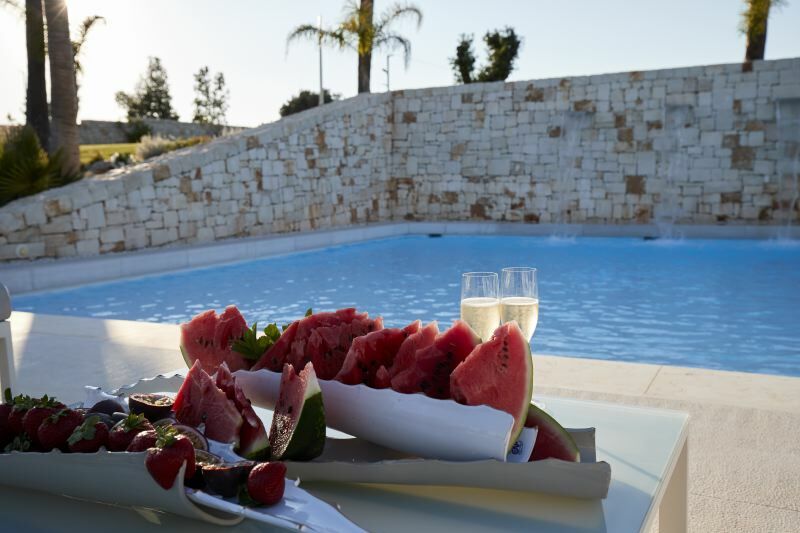 Alternatively the villas can be booked individually (6 beds each) in which case the swimming pool will be shared with the guests staying in the other villa. It is possible, on request, to use the Chef service for the preparation of suppers featuring typical local menus. 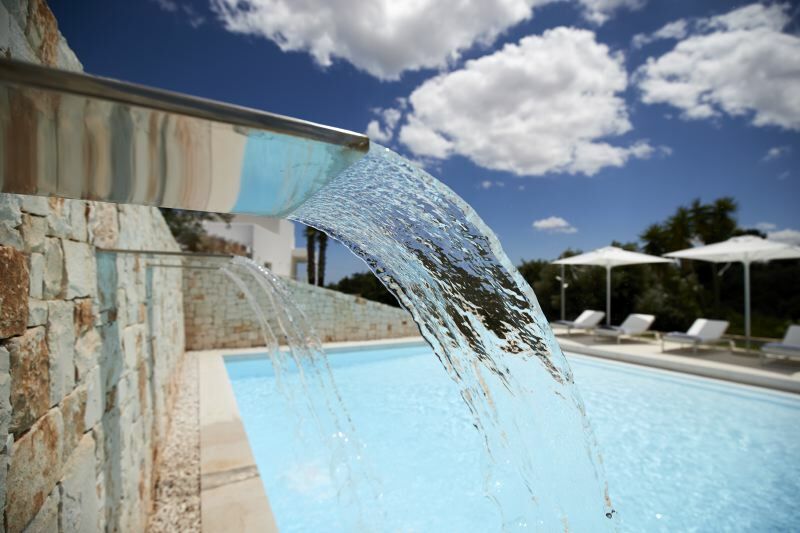 The property consists of two villas of equal size, Quercia and Ciliegio, situated on both sides of the swimming pool. They can be booked together with exclusive use of the swimming pool, or individually with shared swimming pool. GROUND FLOOR: living area with sofas, armchairs, LCD TV; dining area with stone fireplace; fully equipped kitchen with oven and dishwasher; downstairs bathroom; laundry room. FIRST FLOOR: double bedroom with king-size bed, LCD TV, walk-in closet, bathroom with double washbasin, independent shower and bathtub; double bedroom with queen size bed, LCD TV, walk-in closet, bathroom with shower; double bedroom with French size bed, LCD TV, walk-in closet, bathroom with shower. Large garden with patio, WI-FI internet connection, Sky TV, TV systems with video and music on-demand, satellite channels, telephone, safe.